If you were referred by one of our Partners, including those that might be a Club, Rescue or any other Cause or Organization, please enter the "id code" they shared with you into the box below as needed. Specially designed for those that cannot top dress our original Bug Check, by combining with our free-choice Red Cal, it's 2 great products in one! Bug Check "Field Formula" is designed for those that cannot top dress original Bug Check because they aren't either providing our feeding program, don't feed grain, don't feed oats (our preferred feed) or for any other reason. 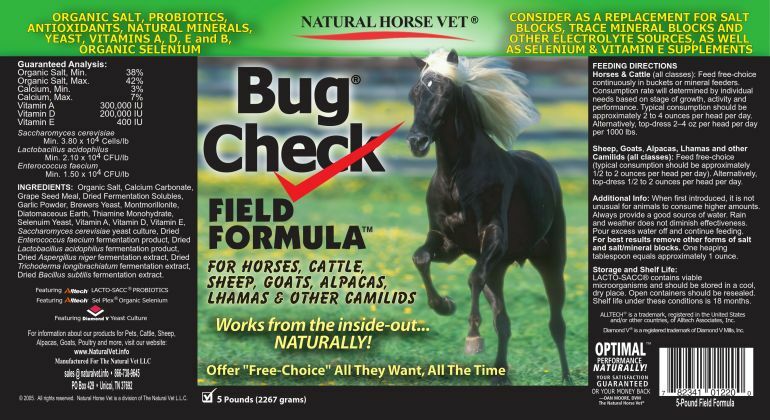 Like our Red Cal and original Bug Check, it's for Horses & Cattle (all classes), Donkeys, Mules, Sheep, Goats, Alpacas, Lhamas and other Camilids (all classes). INGREDIENTS: Organic Salt, Calcium Carbonate, Grape Seed Meal, Dried Fermentation Solubles, Garlic Powder, Brewers Yeast, Montmorillonite, Diatomaceous Earth, Thiamine Monohydrate, Selenuim Yeast, Vitamin A, Vitamin D, Vitamin E, Saccharomyces cerevisiae yeast culture, Dried Enterococcus faecium fermentation product, Dried Lactobacillus acidophilus fermentation product, Dried Aspergillus niger fermentation extract, Dried Trichoderma longibrachiatum fermentation extract, Dried Bacillus subtilis fermentation extract. 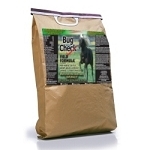 Horses & Cattle (all classes): Feed free-choice continuously in buckets or mineral feeders. Consumption rate will determined by individual needs based on stage of growth, activity and performance. Typical consumption should be approximately 2 to 4 ounces per head per day. Alternatively, top-dress 2–4 oz per head per day per 1000 lbs. Sheep, Goats, Alpacas, Lhamas and other Camilids (all classes): Feed free-choice (typical consumption should be approximately 1/2 to 2 ounces per head per day). Alternatively, top-dress 1/2 to 2 ounces per head per day. Additional Info: When first introduced, it is not unusual for animals to consume higher amounts. Always provide a good source of water. Rain and weather does not diminish effectiveness. Pour excess water off and continue feeding. For best results remove other forms of salt and salt/mineral blocks. One heaping tablespoon equals approximately 1 ounce. - First, Our Feeding Program regardless! - Original Bug Check PLUS the "Field Formula" Bug Check. 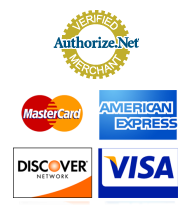 (Note that this product can/will replace the Red Cal component in the FeedForSuccess.com program). - Then, Adhere 100% to our Feeding Program. *Note: If you provide Bug Check Field Formula, you will not need to provide Red Cal separately in normal conditions. Now EVERYONE can enjoy the benefits of BUG CHECK!